IF YOU ARE AWARE of the term “deep stops”, you might also be aware that they were becoming increasingly popular but over the past couple of years have been the subject of increasing controversy. I’m going to explain what we mean by a deep stop, the ideas behind the concept and the controversies, and will also try to explain how deep stops are linked to gradient factors and, most importantly, what all of this means for us as divers. The traditional view of deco theory goes back over 100 years to JS Haldane’s work for the Royal Navy at the start of the 1900s, and subsequently refined by the US Navy and Professor Buhlmann in Switzerland in the 1960s and ’70s. This view says that as we go deeper we absorb or on-gas nitrogen and eventually reach saturation, the point at which the tissues can take on no more nitrogen. At the end of the dive, as we ascend, we become supersaturated – in other words, the tissues now have more nitrogen than the gas we’re breathing at ambient pressure. This is known as supersaturation. Supersaturation, as indicated by the prefix “super”, is a good thing, because it allows off-gassing. The shallower we go, the more supersaturation we experience the better, because the higher the level of supersaturation the more off-gassing we get, and we will be off-gassing as efficiently and as quickly as possible. 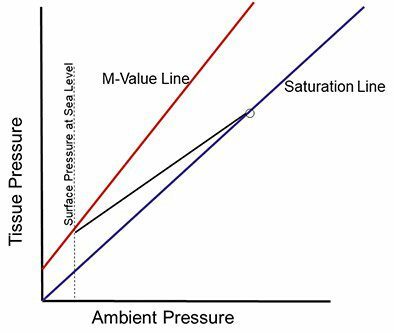 Figure 1: Supersaturation and m-values. This makes the decompression as efficient as possible (figure 1). However, like most things in life we can have too much of a good thing. There is such a thing as too much supersaturation, and in fact there is a maximum value or m-value that represents the point at which there is too much. Beyond this point, we enter what is known as critical supersaturation and as the word “critical” might suggest, this is no longer a good thing. This is the point at which bubbles form and decompression illness (DCI) occurs. 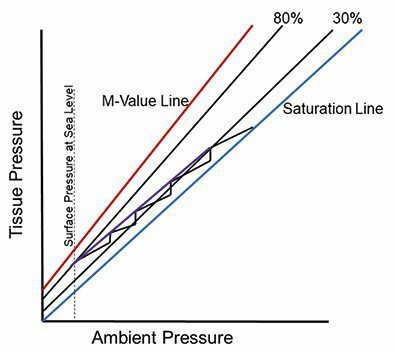 This is why the traditional approach to decompression has been to ascend as shallow as possible to allow as much off-gassing as possible but without breaching the critical supersaturation limits and causing DCI. This was all very well until we started to realise that things were not quite as simple as this. The traditional view has the m-value as a firm boundary. Stay within that line and all is well; cross it and bubbles start to form and we get DCI. Unfortunately, the body is not as black and white as this and it is impossible to say exactly where the m-value line actually lies. In addition, who is to say that your m-value line is in exactly the same place as my mine? Even though the m-value is drawn as a distinct line, it is better thought of as a fuzzy line area in a very wide grey area (figure 2). Figure 2: M-values are a solid black line through a fuzzy grey area. A technology developed in the 1970s, it became clear that it was possible for bubbles to form even if we were well inside the m-value line. 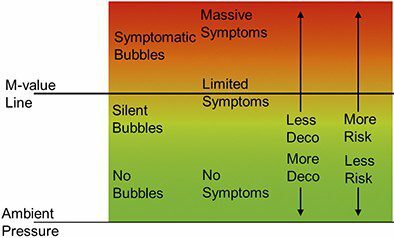 These bubbles, known as “silent bubbles” or “asymptomatic bubbles”, would form well within the traditional m-value limits. This is a big problem for the traditional model, because it assumes that bubbles cause DCI, and if bubbles form then we will get DCI. The reality is that we do get some, and often lots of, bubbles forming and yet do not get any traditional sign or symptoms of DCI. As a result, decompression researchers started to look at the implications of these bubbles, and how to manage them. Bubble models were developed to try to control the formation and growth of these bubbles. This was achieved by stopping deeper than the traditional decompression stops, and this was the source of the deep stop concept. We might not be able to stop bubbles forming, but by stopping deeper we can try to stop the bubbles from growing to a size at which they cause too many problems. 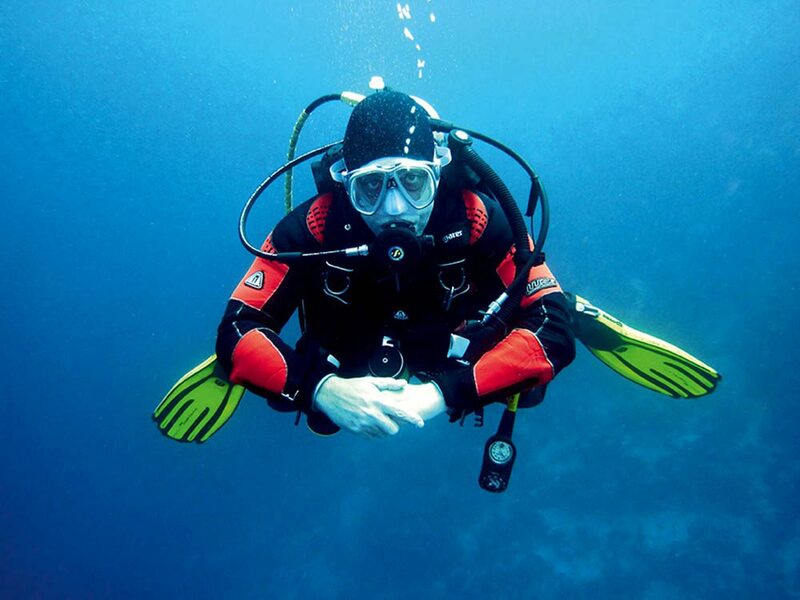 Pyle stops, deep stops and bubble models started to be introduced in the 1980s and 1990s and to be adopted by technical divers. Pyle stops were among the first approaches to dealing with deep stops. The concept introduces a deep stop halfway between the maximum depth and the first traditional decompression stop. So for a 40m dive with the first stop at 9m, we would introduce a Pyle stop halfway between 40m and 9m, which is approximately 24m. Another stop would then be introduced halfway between the first deep stop and the first traditional stop, so halfway between 24m and 9m, at around 15m. 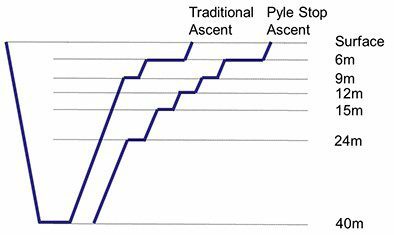 This is repeated until there is less than 3m between the last Pyle stop and the first traditional decompression stop. So, in this case, we would put in another deep stop at 15m plus another at 12m before carrying on to the first traditional stop at 9m (figure 3). PYLE STOPS are a very simple way of incorporating deep stops but represent a simplistic approach because they don’t take any account of the time spent at depth. Bubble models such as VPM or RGBM are a more sophisticated way of achieving the same goal. In addition, gradient factors can be used to achieve that same objective. They can be made to sound very complicated but are just two numbers, a high gradient factor (GF) and a low gradient factor. Both are expressed as percentages and they represent a percentage of the way towards the m-value. 30/80 are popular gradient factors. In this case the low GF is 30% of the way to the m-value while the high GF is 80% of the way to the m-value. This means that the first deep stop will be introduced at 30% of the way to the m-value rather than at the m-value itself or, to put it another way, at 100% of the m-value. Similarly, a high GF of 80 means that the final stop will not be cleared until the diver is at 80% of the m-value, rather than at 100% of the m-value. This means that the low GF controls the depth of the first stop, while the high GF controls the length of the last stop. It’s a nice theory, and tec divers during the 1990s and into the 2000s were very keen to promote the idea that deep stops are good (figure 4). But, even though it’s a nice idea, and many technical divers were bordering on evangelical about it, is there any proof that the theory works? In reality most of the research into deep stops has been inconclusive at best. A study in 2005 failed to find any significant benefit, and another in 2010 found that bubble models resulted in a worryingly high level of bubbles, even though they’re supposed to control the level of bubbles. However, it was a US Navy study in 2011 that caused us to start to rethink bubble models. This study seemed to indicate that they caused more problems than a traditional model, and caused a huge amount of discussion. It wasn’t a great study, and didn’t really do the sort of deep stops that divers actually do. There were also a number of other questions about the structure of the study that called into question the results. However, it did get people talking about the idea. THIS SINGLE STUDY might have been discounted had it been the only one to indicate this result, but combined with other studies with similar results it started to form a body of evidence that deep stops might not be the panacea that we previously thought. An unpublished study carried out for one of the Scandinavian navies seemed to confirm the results. Unfortunately, as with many things public opinion tends to be all or nothing, and this result has been taken as meaning that deep stops are bad. The question we must ask is this: why did the deep stops seem to fail in this case? The obvious answer is that the deep stops are too deep. This study does not prove that deep stops are bad although it does, along with the other evidence, seem to indicate that you can have deep stops that are too deep. So what is “too deep”, what is a “good” deep stop and what is a “bad” one? Part of the problem is that the term “deep stop” is very vague, to the point of being meaningless. In the example above, with a maximum depth of 40m and a first traditional stop of 9m, in theory anything deeper than 9m would be considered a deep stop. A stop at 39m, just 1m up from the bottom would be a deep stop, while a stop at 12m, just 3m deeper than the 9m stop, would also be considered a deep stop. Figure 5: Effects of different gradient factors. Clearly there’s a big difference between a deep stop at 12m and one at 39m. The question is: how deep is too deep? To be a bit more objective, the table shows the result of a dive-planning program for a rebreather dive to 60m. It shows the stops resulting from using gradient factors of 30/80 and a range of others. I have chosen a 60m dive because the deeper the dive, the more pronounced the effects become on the dive. I have also planned it as a closed-circuit rebreather dive to remove any potential effect on the ascent profile caused by gas-switches (figure 5). THE FIRST THING to say is that small changes in the gradient factors don’t make a big difference, but when we look at the whole range we can start to see the patterns. First off, let’s keep the high GF constant at 80 while we change the low GF from 10 up to 50. 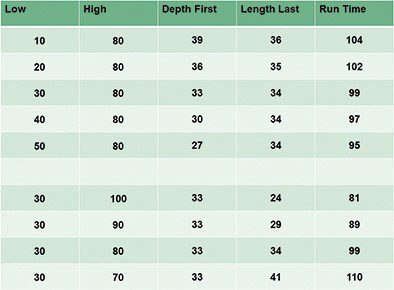 Remember that the low GF affects the depth of the first stop, and we can see this in the table. In this example every 10% change in the low GF results in a 3m change in the depth of the first stop, exactly as expected. However, if we now look at the low GF in the range 30-50, we can see that the length of the last stop is constant at 34min. As the low GF is decreased even more, and stops are introduced at 36m and 39m, we can see that the time of the last stop increases to 35min and then 36min. The reason for this is that the additional stops at 36m and 39m are resulting in more on-gassing in the medium and slower compartments, which then required more decompression in the shallows. From this, we can see that a low GF below 30 is making the situation worse, not better. When we keep the low GF constant at 30 and change the high GF from 100 down to 70 we can see that the length of the last stop increases from 24min to 41min. It’s clear from this example that reducing the high GF forces the model to wait for more inert gas to be off-gassed before the diver is allowed to ascend, so lower values of the high GF setting are more conservative than higher numbers. From this example, we can see that deep stops are complicated and it isn’t always easy to get simple answers. OVERALL WE CAN DRAW a number of conclusions from recent studies and discussions. The first is that “deep stops” is a misleading term that doesn’t always help the discussion. Perhaps it’s time to move away from using this term in favour of being more specific as to exactly what sort of stops we’re talking about. The next conclusion is that it is definitely possible to stop too deep, as shown by some of the examples above. Some of the advice given over the past few years has clearly been introducing stops that are too deep. However, a knee-jerk reaction to say that “deep stops are bad” would be to swing too far the other way, and we should be careful not to throw the baby out with the bathwater. The inescapable conclusion is that we don’t know all the answers and should be wary of anyone who tells us that they know exactly what the “correct” decompression profile is. Our knowledge of decompression theory is developing, if sometimes at a very slow pace, and it’s important to keep up with the latest thoughts on decompression theory to ensure that we’re not using out-of-date ideas.